Find yourself overstretched at Christmas? Start prepping now! It’s easy to find yourself in a hole at Christmas and we are not talking about the one you find yourself in after drinking too much. 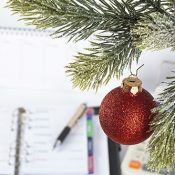 No we are talking about financial black holes, that many people end up stuck in over the festive period and that can keep you stuck with repayments well into the New Year. But don’t fear if this is you, we can help you from facing these issues with a few simple steps from online money saving and voucher code website My Voucher Codes, who have prepared their Christmas financial guide. If you have some of your own tips add them in the comments below!